Richmond, VA (April 26, 2018) -- kaléo, a privately-held pharmaceutical company, today announced that AUVI-q® (epinephrine injection, USP) 0.1 mg will be available nationwide by prescription beginning May 1, 2018. AUVI-q 0.1 mg is indicated for the treatment of life-threatening allergic reactions, including anaphylaxis, in infants and toddlers weighing 16.5 to 33 pounds (7.5 to 15 kilograms). 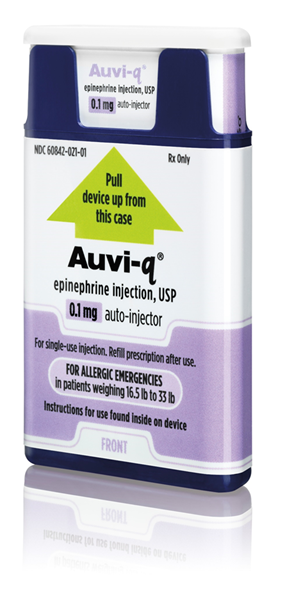 Featuring a shorter needle length and lower dose of epinephrine than other FDA-approved epinephrine auto-injectors (EAIs), AUVI-q 0.1 mg is the first and only FDA-approved EAI designed for this patient population. Like the rest of the AUVI-Q family, AUVI-q 0.1 mg features a voice instruction system that helps guide caregivers step-by-step through the injection process, as well as a needle that automatically retracts following administration. Each AUVI-q0.1 mg prescription includes two auto-injectors and one Trainer for patients and caregivers to practice administration before an allergic emergency happens. The AUVI-q 0.1 mg will also include a 2 second countdown, like the 0.15 mg and 0.3 mg doses. To learn more about AUVI-Q (0.3 mg, 0.15 mg and 0.1 mg), visit www.auvi-q.com, or follow AUVI-Q on Facebook or Twitter. For questions on how to get AUVI-Q, please call the AUVI-Q hotline at 1-877-30-AUVIQ. The sNDA for the AUVI-q 0.1 mg was granted Priority Review by the FDA, an expedited regulatory pathway reserved for products that may provide significant improvements in the safety or effectiveness of the treatment, diagnosis, or prevention of serious conditions when compared to available therapies.